Easter's on its way! This is my favorite holiday of all. Easter crafts have been coming home from school and Mini Eggs have been eaten with gusto. We'll buy our ham tomorrow morning. I have a tasty holiday dinner planned, along with a simple brunch. We'll have a quiet holiday at home, just the four of us. On Saturday night, we'll make the small Bears' Easter baskets and hide jellybean-filled eggs for them in the backyard. I bought their Easter goodies a few days ago. We keep it pretty simple but I think they'll like them. The GB is getting a new box of sidewalk chalk and a Hello Kitty wristwatch; she really wants a watch of her own, just like Brother. He's getting some new tennis balls and a bag of "punch balloons." The candy is to be divided between them. I'm almost done with the top of my Scrappy Trip-Along project! 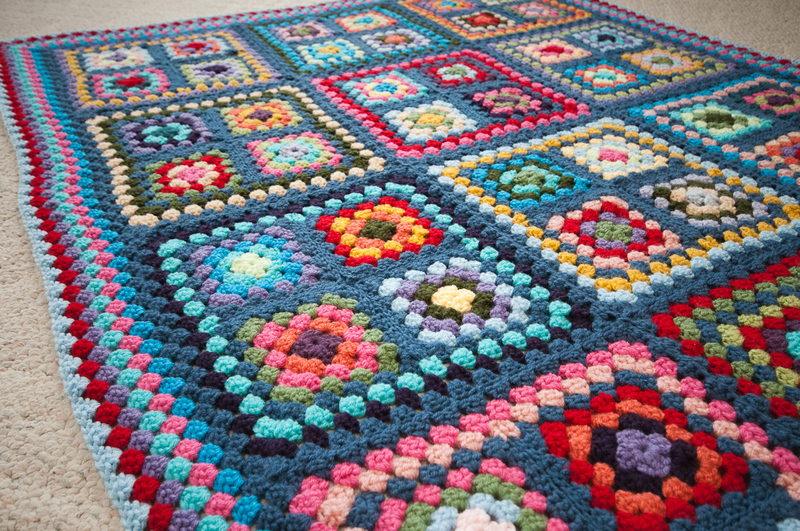 I had plenty of time to work on it this week with the traditional granny afghan finished. I've never been one to have more than a couple of WIP's at a time; I find it stressful. I like being back down to just one. ~ I survived my annual (lady-related) exam. I rewarded myself with a vanilla milkshake and a pretty skein of yarn. ~ It has been warm all week, dare I say it's even been kind of hot in the afternoons. More sun than clouds, but not the most brilliantly sunny week overall. I'll take the warmth, though. ~ There is no school today and we're ahead in our homeschool work. We have the GB's pre-ballet class this morning. This afternoon, a good friend who makes me laugh a lot is coming over with her two little boys. We'll play in the backyard and have a good time. ~ I'm eating strawberries every day lately. This is the way life should be. Thank you so much for the compliments on my granny afghan. I really appreciate your kind words. It's done! I have finished my granny afghan. This was not my favorite project to work on, as there were pitfalls and annoyances along the way. But now that I have finished making it, I feel better about it every day. So grab something hot to drink (I have my tea), and let me tell you the story of my traditional granny afghan! It all started back in early January when I spent a morning at Hobby Lobby, perusing yarn. I'm probably an irritating customer, what with the way I spread yarn out all over the floor in the yarn aisle, looking for the perfect combination of colors. People probably can't wait until I just get the heck out of there already. Choosing the yarn is one of the best parts of starting a new project and I think people ought to understand that. Nobody really seemed to mind, but I do think stores which sell yarn should all have big open spaces to try out colors together; so far I have only seen this in small, independent yarn shops. I wanted bright, vibrant colors which would stand out against my main color, a dark blue. This blanket was intended for use in our family room, where the couch and recliner chair are upholstered in dark blue chenille. At home, I added assorted small bits of worsted acrylic yarn I had left over from other projects, and I had quite a wide spectrum when all was said and done. I started making individual five-round granny squares. 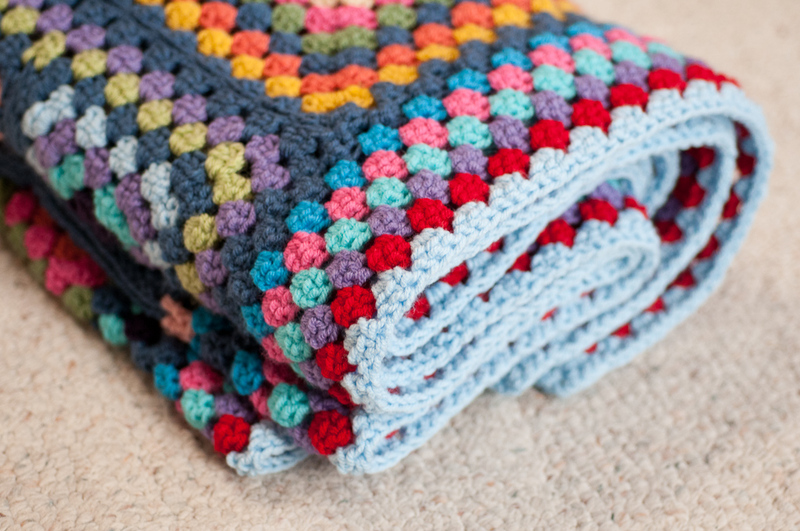 My plan had been to stitch them all together into a giant blanket after they were made. I had originally planned to make, I think, 146 of them, to achieve a certain size. It was going to be big. I got to work immediately after I bought the yarn because I had a LOT of squares to make. 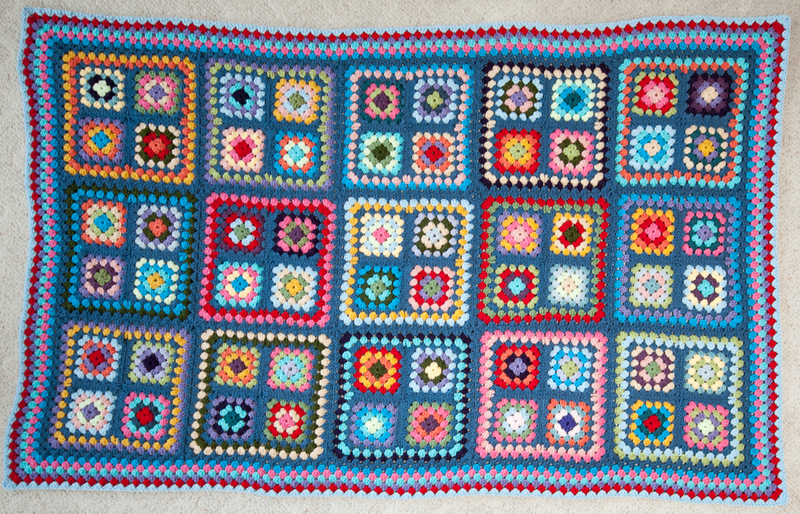 I used Bunny Mummy's granny square tutorial, which I also used for my giant granny square. I liked making the squares. It was really fun to come up with combinations of colors and to play around with darks and lights. I wanted this blanket to look very scrappy, like it really had been made by somebody's "granny" a long time ago. And making granny squares is very addictive, especially when you get good at them; I was flying through the yarn. I loved making them, but I also loved laying them out as they were made. I would move them around like tiles, deciding which ones looked best together. 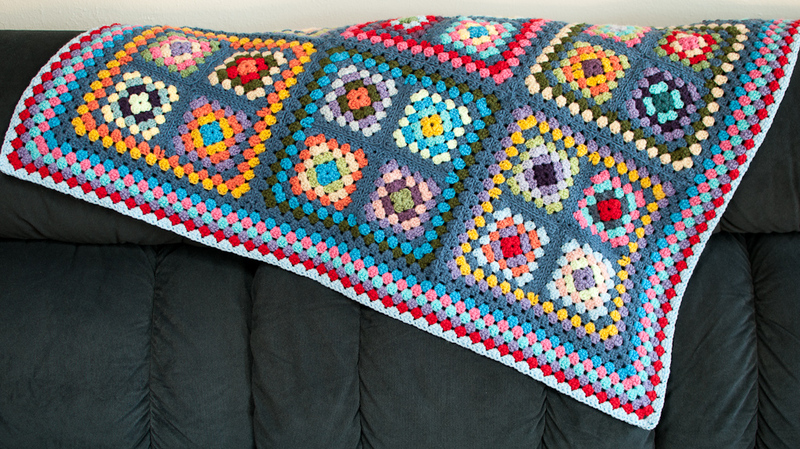 I was still planning to make this blanket out of small squares stitched directly together, remember, so this seemed important. Soon, I had stacks and stacks of these little squares. When it got warmer out, I even took my show outdoors, hooking on the patio as my small Bears and I whiled away the sunny afternoons in late winter. Ah, bliss. And then I realized something: three skeins of my main color might not be enough. I realized this around the time I had fifty squares made. I panicked at this point because I had heard through the Ravelry grapevine that Hobby Lobby was possibly discontinuing their I Love This Yarn worsted acrylic, with plans to bring it back under a new manufacturer sometime in the future. I checked our local store, and they had almost nothing left, and neither did their website. My own color was completely out of stock in both places. I asked for help on Ravelry and had a very helpful offer from the lovely Kashi (Ravelry and bloggy friend) to check in her store where she lives in Iowa so that she could send me a skein; alas, they were all out in Iowa too. Silly me, I should have just bought a lot more yarn while they had it, but I didn't know they would discontinue the whole line. They really should have hung a sign to warn people. I am sure that would have been bad for their business, but this was becoming bad for my mental health. I really worried about it, especially after all the work I'd already done, not to mention the money spent. So I revised my plan: now I would make only eighty squares, but I would put them together in blocks of four, with several rounds of color around each block, and then sew the blocks together. 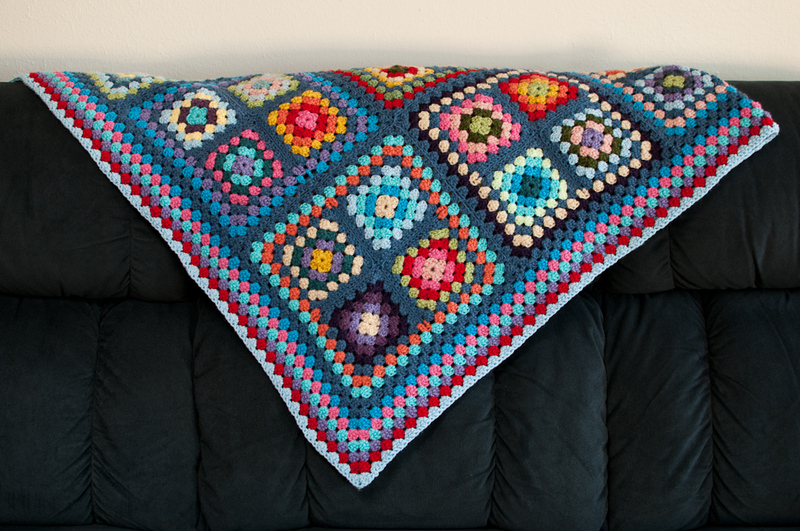 It would look very similar to Lucy of Attic 24's gorgeous Big Blanket in its design. The blanket would still be large, but I would not need as much of the main color. It seemed like a fine plan. When I had all eighty squares made, I spent most of an afternoon doing my tile job with them. There were so many to play with and I loved every second of playing with them. Now I needed to stitch them together in fours to make blocks, and then do a few rounds of color around each block, with the blue as the outer round. I had twenty of these blocks when I was done. Then I was going to stitch the big blocks together. But I soon realized I didn't have enough yarn to do that either. So I taught myself Lucy's join-as-you-go method, which was actually very easy; I'm glad I learned it and I know I will be using it again. I chose to do the joining this way because I thought it would save yarn, and it did. I was still frustrated, though, because this was yet another change to my plans and I didn't particularly want to learn a new technique just then. I like to learn new things without so much duress, ordinarily. Once the blocks were joined, I could start my border. I never understood why people bothered with edgings or borders; it always seemed to me that they were superfluous. 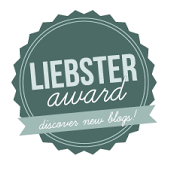 But Lucy's blog, as well as others like Jacquie/Bunny Mummy's, showed me otherwise. Blanket borders are wonderful. For the border on my blanket, I chose to do one round of the main color, which just about finished off my supply of it. 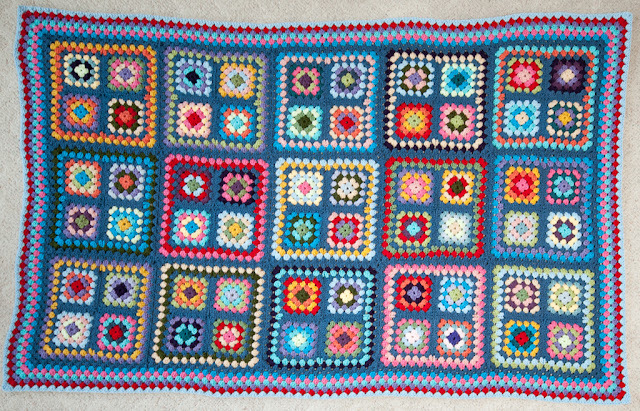 Then I did six more rounds in other colors from the blanket. For that first round using my main blue color, I followed Bunny Mummy's tutorial for making a flat edge on granny squares. I also used this technique for the first round of each of the small blocks of four squares, just to keep them flatter too. I finished the whole thing last Thursday afternoon, at the end of our book-on-CD session. I was thrilled! The blanket looked pretty good and my small Bears immediately started using it, wrapping themselves in it on the couch. Since then, it's been used almost constantly. Want to see it? Here's a whole bunch of photos! What do you think? I like it. The Bear says it reminds him of millefiori glass. That's a little fanciful, but I see what he means. 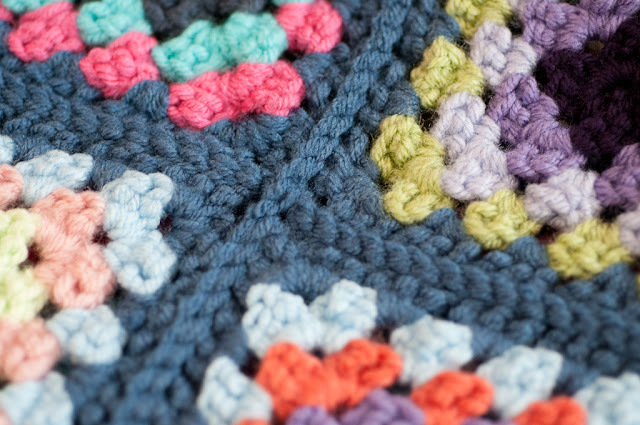 Each small square does look a little bit like a flower, which makes me excited to try one of the more flowery granny square patterns. Here are some closer-up photos of the more technical aspects of making this blanket, since I did a few things which were new to me. First, here's a photo of my JAYG seams; it took a little while to get the hang of this method, but it really wasn't bad at all. I think this will be the go-to method for me now. And here's the slip-stitching I did for the original joins of the small squares into fours. I don't know that I'll join this way again in the future, unless there's a good reason not to JA(I)G; this actually makes my hands hurt while I hold the squares sandwiched together for stitching. It did come out nice and neat, though. The little ridge is kind of attractive to me. 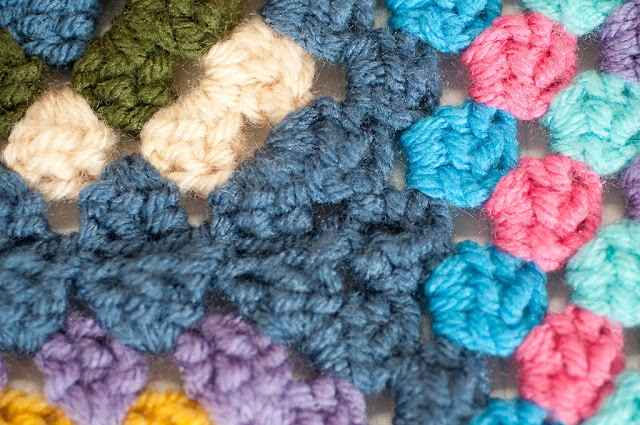 This photo shows how the flat-border method works; you would do this at the juncture of two granny square corners. It's a 2dctog in the right-hand corner and 1dc in the left-hand one. 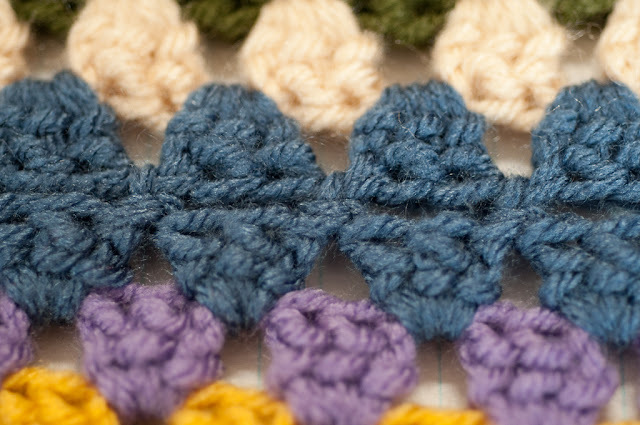 This reduces the number of stitches therefore keeping the border from getting too bunchy or wavy, which is what would happen if you just did a regular granny cluster (3dc) in each space. Can you see in the above photo? Between those two turquoise clusters, you can see the 2dctog/1dc combination in the darker blue. The blanket actually ended up being quite large, certainly big enough for our TV-watching and fort-building needs. I tried it on the GB's bed, and it could even be used as a coverlet. She wasn't actually that pleased with my experiment and asked me soon after if I would "please put my owls and head-chops [hedgehogs] blanket [her usual quilt] back on my bed now?" Yes, ma'am. Of course. 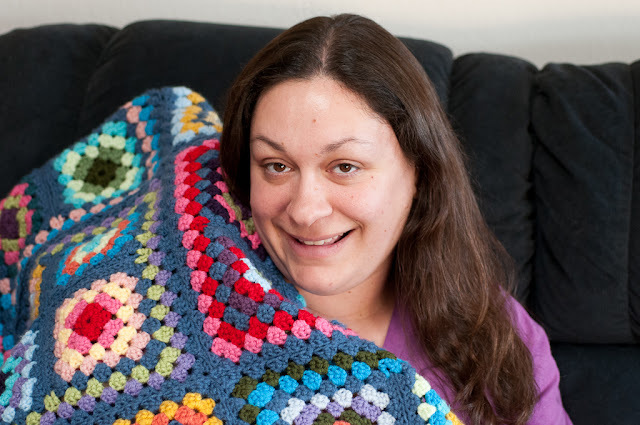 And how about a picture of me with my blanket? Getting daring now, posting a picture of my whole face. 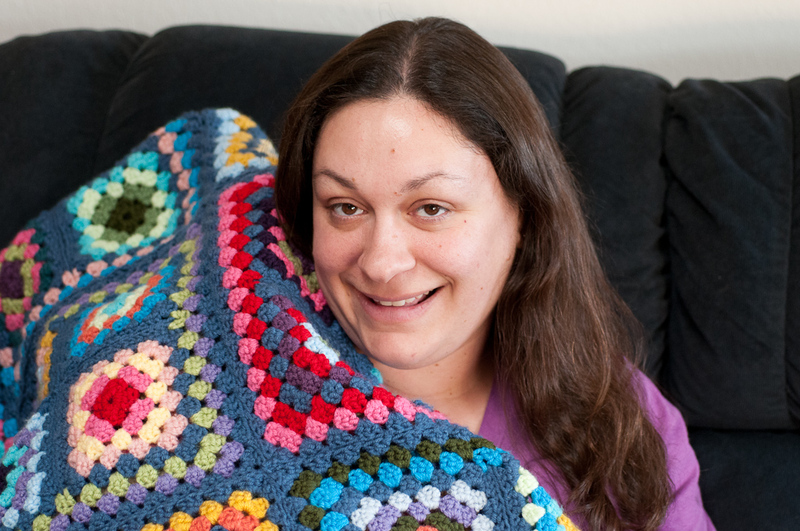 Please excuse the pasty, exhausted look; I was lying awake all night thinking about my blanket! 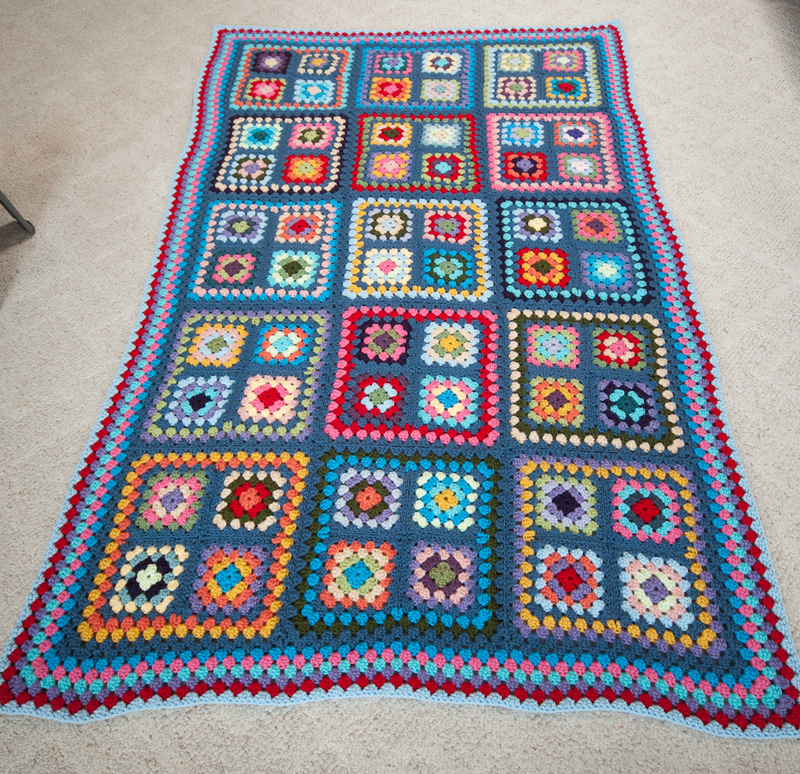 And that's my traditional granny afghan. We've been through a lot together. We've laughed, we've cried, we've even done a little bit of swearing. But in the end, we're good friends. We've shared a true adventure. Began January 6; finished March 21. Go make one! 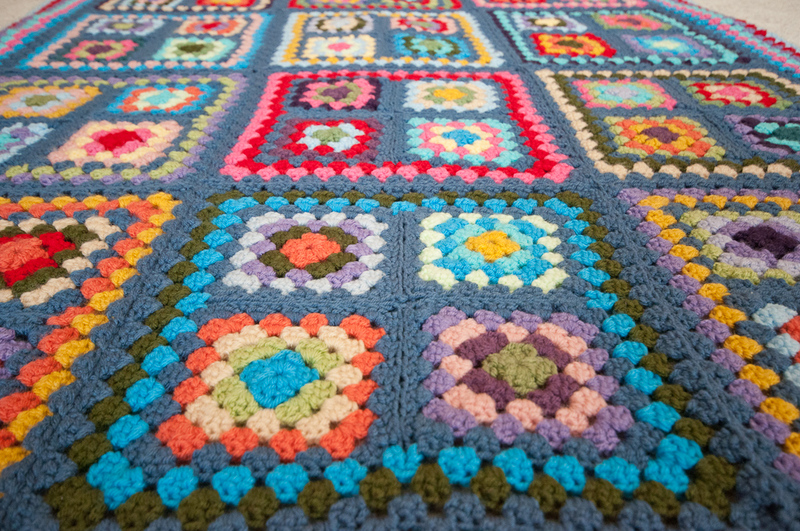 Make yourself a funky, vintage-y granny afghan and show it to me when you're done. Flowers by my bedside make me very happy. It's a simple way to make the bedroom feel fancy. These daffodils are in a jar prettified by me. I've been loading up on daffodils lately; they're inexpensive and so cheerful. I think I'll buy some more when I shop later this week. These are Cadbury Mini Eggs in an antique cut-glass dish. So totally happy. As a devotee of the GreenGate blog, I was very excited a few months ago when they announced a lower-cost line of their clothing to be sold at UNIQLO, but we don't have one of their stores and shipping is a little high for buying online. I really wanted one of their stoles, though. I was still pining for one when I went to Payless Shoes and found the above scarf! The print is a little different from the GreenGate ones, but so pretty. I love the colors and the size; it's huge and can be worn in a lot of different ways. I wore it last week with my favorite bright pink t-shirt, and it dressed up my shirt nicely. I'm so happy with this find. Thank you for all of your lovely comments on my posts and photographs. I especially appreciated the comments on my "Lazy afternoon" post, pertaining to my family's life at home. It's very important to us to have an organized, peaceful home, to truly love being at home together doing simple things, and we try very hard to impart that to our small Bears. It isn't always easy, as any parent knows. But I'm glad our choices seem to come through so clearly in my writing and photos. My time at home with my family is one of the greatest pleasures in my life. To borrow a line from one of my favorite movies, "It's all happening." Spring is here, officially. And spring has sprung in the yard. Roses have leaves. Everything is greening up quickly. We even have flowers: my pink hyacinths bloomed in the past couple of days. The weather has been a little changeable this week; we've had a fair number of cool, cloudy days and there's a storm coming through this weekend which will bring especially cool temperatures and high winds. I hope this won't be the swan song for my plum blossoms. I love this time of year and the way it all seems to happen at once. One morning this week I looked out the kitchen window toward the trees across the arroyo. They were green! A pale green haze surrounded them like a mist. They hadn't looked that way the day before. The wonders of springtime.